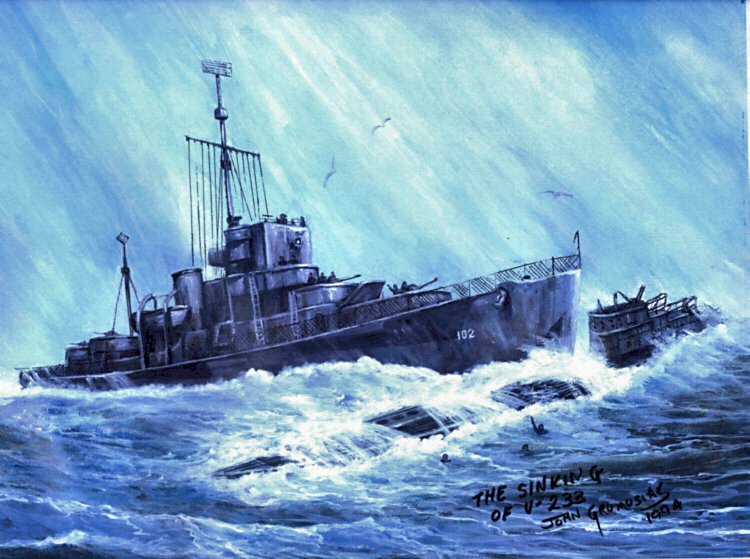 16 January 1943: Keel laid by the Dravo Corp., Wilmington, Del. 59k Clarence Crase Thomas was born on 26 December 1886 in Grass Valley, California. He was appointed midshipman on 07 July 1904 and graduated from the United States Naval Academy on 05 June 1908. After service in armored cruiser Maryland and gunboat Yorktown, he was commissioned ensign on 29 June 1910. In the next few years, Thomas served in Denver, Cleveland, and West Virginia. Appointed lieutenant (jg.) 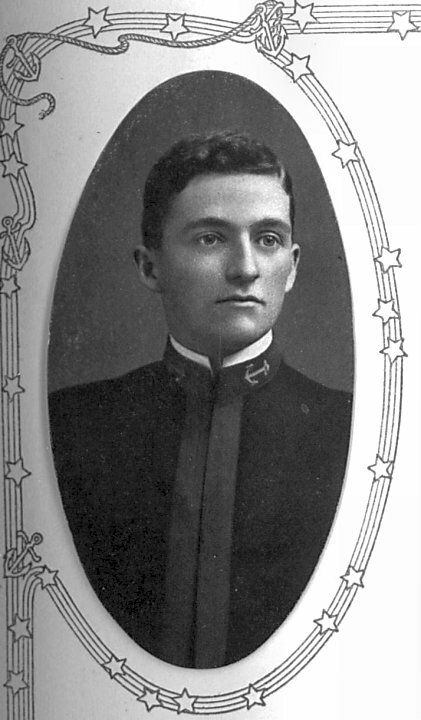 on 26 June 1913, he was detached from West Virginia in the summer of 1914 to attend a post-graduate course in steam engineering at the Naval Academy. He attended Columbia University in late 1915 and, on 24 June 1916, reported on board Florida as her electrical officer. Thomas was promoted to lieutenant on 08 January 1917 and, about a fortnight after the United States entered World War I, was placed in charge of the naval armed guard on the merchant steamship SS Vacuum in April. 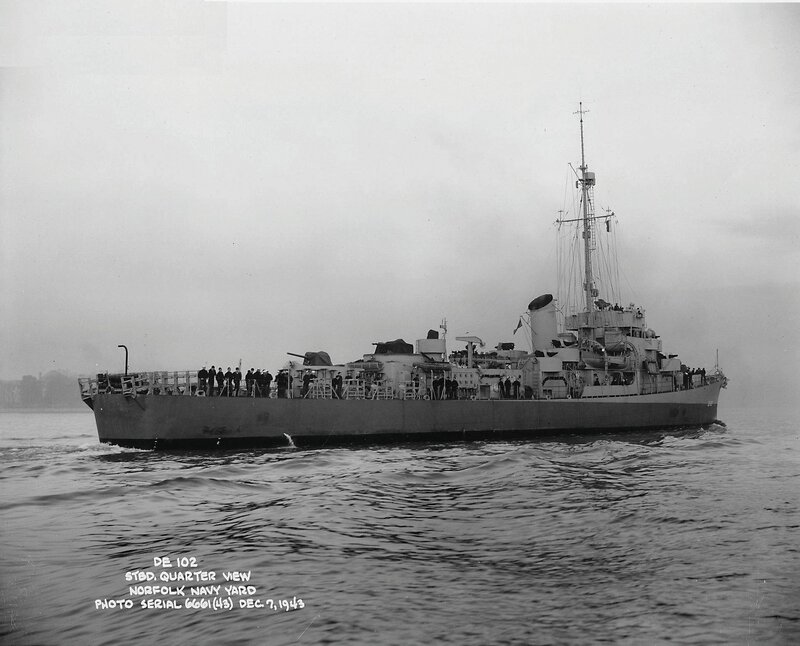 On the 28th, when a lookout reported sighting a German submarine, some 120 miles west of the Hebrides Islands, Lt. Thomas went to the ship's after gun. 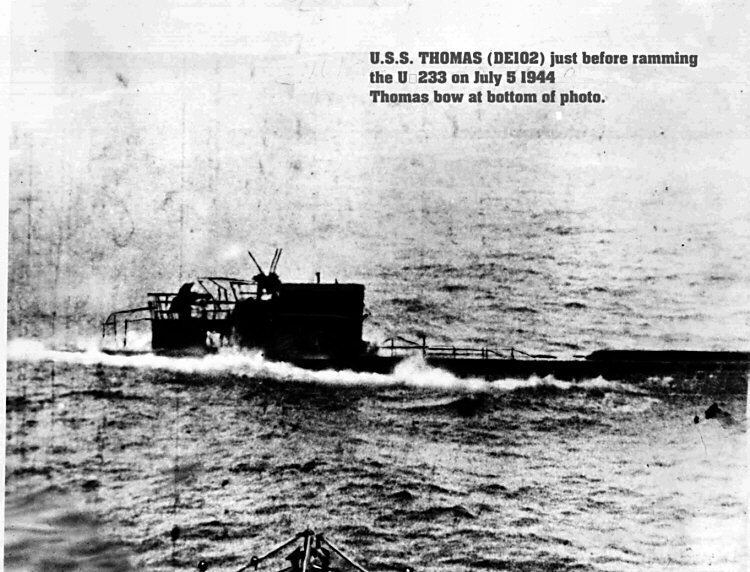 A few moments later, a torpedo from U-21 struck Vacuum, and exploded, throwing Thomas and the gun's crew into the water. The ship sank within two minutes. 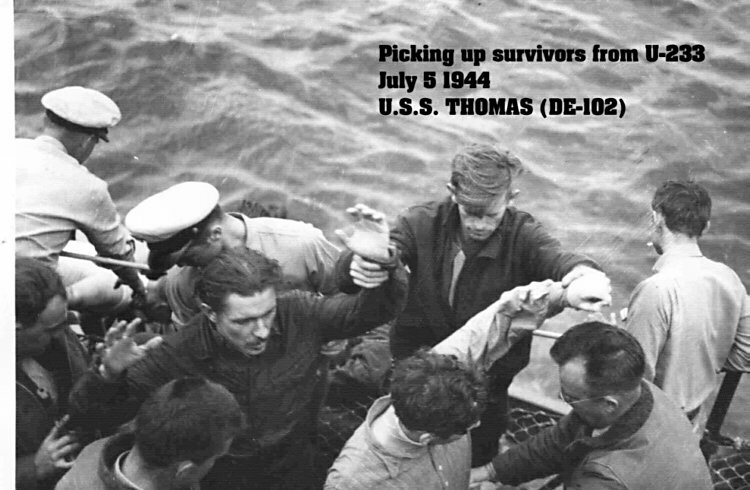 Picked up by a boat, Thomas soon died of cold and exposure. He was the first United States naval officer to lose his life in the war with Germany and was posthumously awarded the Navy Cross "for distinguished service in the line of his profession as commander of the armed guard crew of Vacuum. 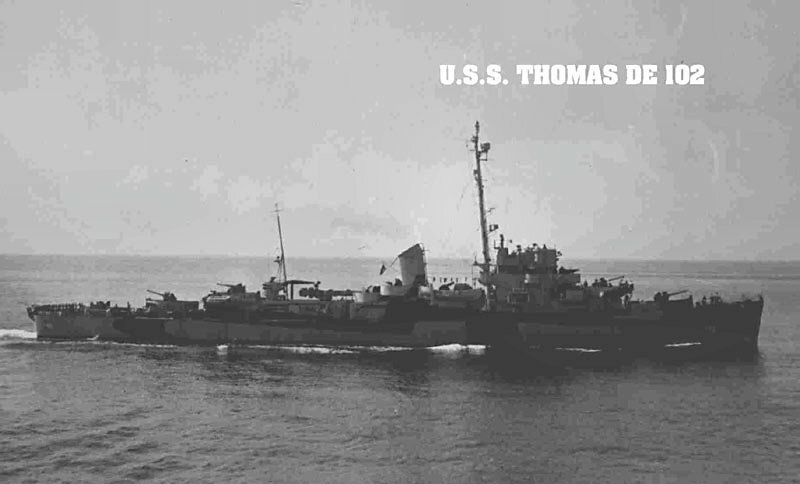 USS Thomas (DE 102) (1943-1947) was the first ship to be named in his honor. 104k 05 July 1944: Photo taken just an "instant" before ramming U-233. Notice bow of Thomas at bottom of photo. 97k 08 July 1944: Boston, Mass. 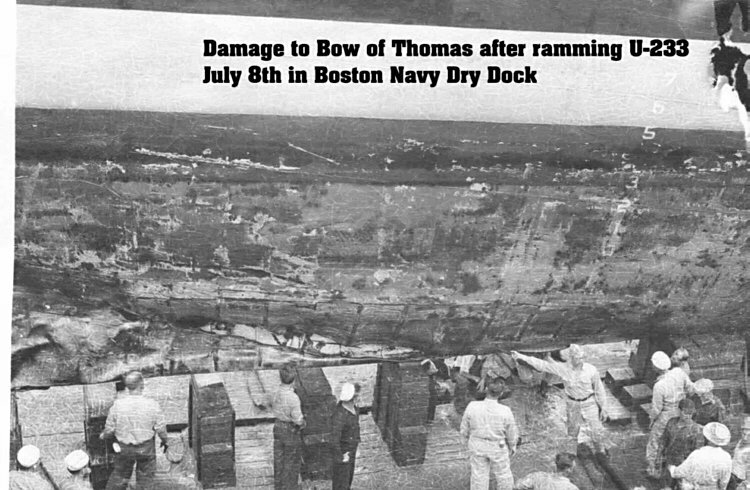 - Photo showing damage to the bow of Thomas after ramming of U-233. Taken in a Boston Navy Yard drydock. 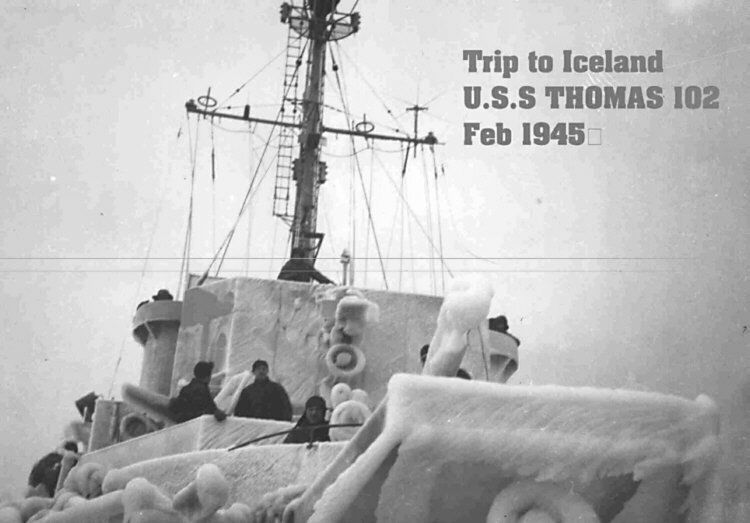 56k Trip to Iceland, February 1945. 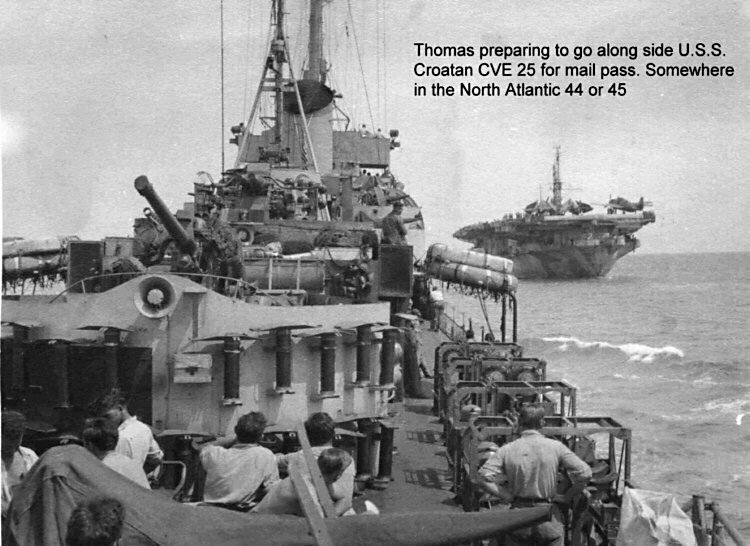 92k 1944 or 45: in the North Atlantic - Thomas preparing to go along side USS Croatan (CVE 25) for a mail pass. 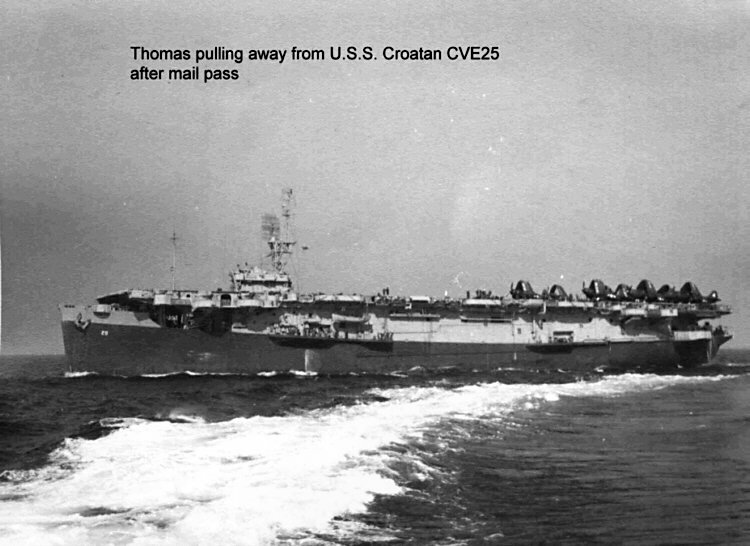 75k Thomas pulling away from USS Croatan after mail pass. 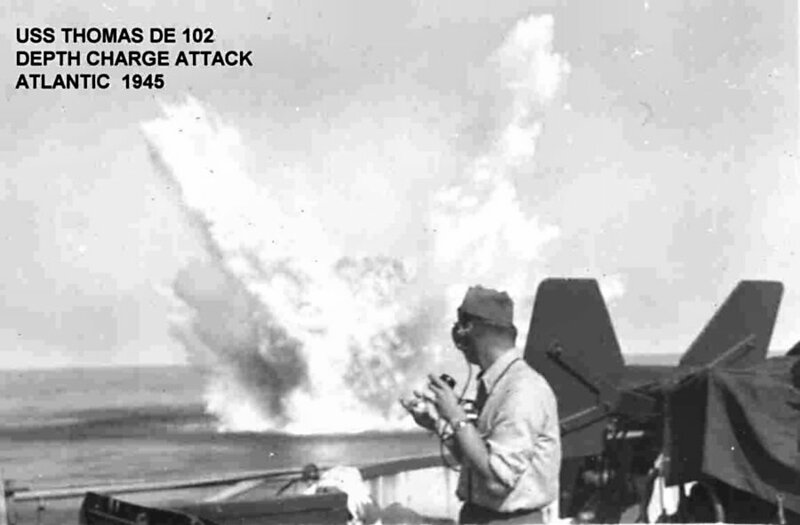 58k 1945: the North Atlantic - Thomas conducting depth charge attack. 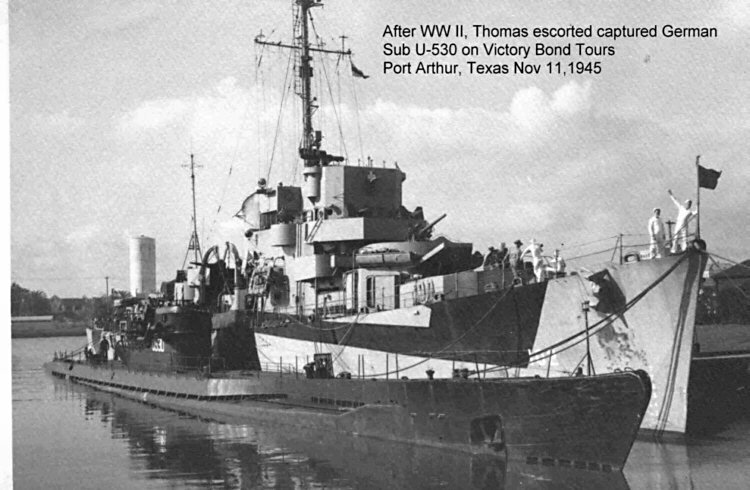 76k 11 November 1945: Port Arthur, Texas - After WWII Thomas escorted the captured German Sub U-530 on Victory Bond Tours. 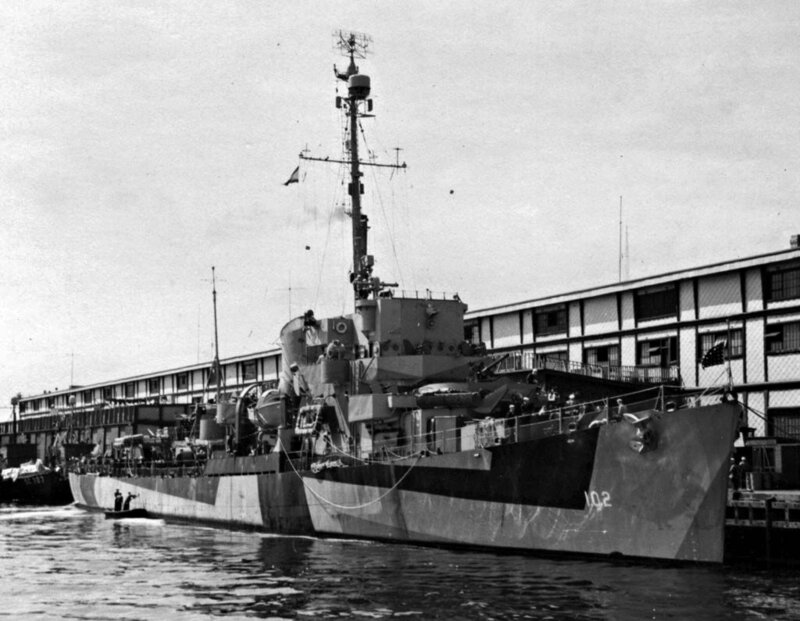 View the USS Thomas (DE 102) DANFS history entry located on the Naval History and Heritage Command web site. 1.) 21 Nov. 1943 - 12 Jun. 1945 Lcdr. 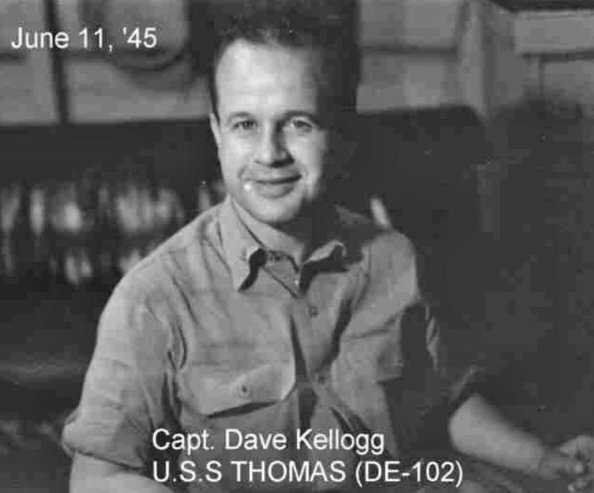 David M. Kellogg, USNR (Comm. CO) (Seattle, Wash. 2.) 12 Jun. 1945 - 01 Oct. 1945 Lcdr. Frank H. Jones, USNR (Malden, Mass. 3.) 02 Jan. 1946 - 02 Apr. 1946 Lt. Robert Judson Sammons, USN (College Station, Tex.